Dr Kevin Cunningham writes about the Irish findings from Reuters Institute Digital News Report in The Irish Times. The latest report on digital news suggests that one should not write off radio and newspapers just yet. Released yesterday, the fourth annual Digital News Report from University of Oxford’s Reuters institute and the institute for the future of journalism at DCU is based on an online YouGov survey of 74,000 people across 37 countries. In relation to radio, the report reveals our love affair with the oral tradition continues unabated. Of all countries in the study Ireland has the largest proportion of people for whom radio was their main source of news, at almost twice the EU average. Over the past four years there has been only a minimal change in the number of people listening to radio as a source of news as a total of 45 per cent of those surveyed had used radio as a source of news in the past week. The report also reveals that in spite of a nascent podcast industry, podcast listenership in Ireland is higher than the US, UK and EU average. In relation to newspapers, the story is a little more complicated. As an annual survey most changes from one year to the next are incremental but there are also some steep trends. In 2015, half of those surveyed (49 per cent, specifically) included newspapers as a source of news they had used in the past week. As this year’s survey shows, that figure has steadily and unrelentingly declined. In 2016 it declined to 45 per cent, in 2017 it declined to 40 per cent and in 2018 to 35 per cent. One might therefore conclude that newspapers are dying – and quickly. However, there is also a steady increase in the number of people paying for news online from 7 per cent in 2015 to 9 per cent in 2016 to 10 per cent in 2017 and now 12 per cent in 2018. Furthermore, we also observe an increase in the number of people stating they are likely to pay for news online from one in eight last year to one in five this year. While we are lower than the European average the changes are all the more remarkable considering the difficulties faced by Irish media in an English-speaking country as, in Ireland, we can get our news from a wide range of free sources from the UK and the US. Undoubtedly the increase in subscriptions is driven by changes in online consumer behaviour where people are more willing to make online purchases but also by the narrative surrounding “fake news”. It is clear that established brands are most likely to benefit from subscriptions arising from concerns about fake news as brands such as The Irish Times and the Irish Independent have among the highest evaluations of trust, bested only by RTÉ and BBC. However, it is not clear that there is sufficient evidence of fake news in Ireland so as to drive an increase in subscriptions. 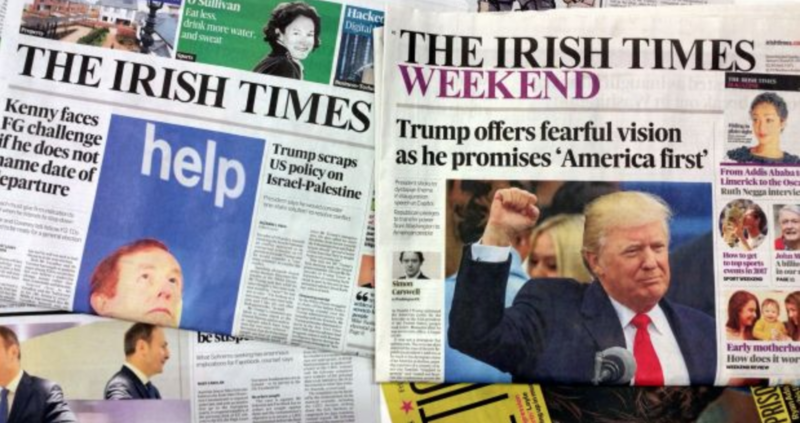 While there was a surge in subscriptions in the US in conjunction with a slump in trust in news more generally Irish news consumers are far more trusting of the news they consume compared to their EU counterparts. While they are less trusting of news on social media and quite concerned with fake news, few have observed incidents of the types of fake news they are concerned about. The B&A RTÉ exit poll from the recent referendum on abortion pointed to the considerable role played by broadcast and print media in the national discussion. As sources of information, voters identified the established media brands to be of more value than information on social media or information from canvassers. While much was made of the risk of fake news and online advertisements, neither appeared to be influential. Radio discussions relayed stories and experiences that helped people to decide while print and online media tended to focus on fact-checking. The results also contradict the notion that our oral tradition is related to lower levels of literacy. Indeed Germany, where the printing press was invented, holds second place in terms of radio consumption. The value of radio in our media mix is undoubtedly positive as studies have shown a respondent’s ability to recall news from radio to be more accurate than when the same information is relayed on television. This healthy media environment is of considerable value and should undoubtedly be protected from the prevailing winds as it makes its steady shift towards paid-for online news. While some may fear quality news will become marginalised, that only the very wealthy will have access, such an assertion doesn’t address failings of the current range of subscription models that don’t fit the nature of online media consumption behaviour, which tends to be less loyal to a particular brand.